We might not be blessed with the sunniest climate in the world here in the UK, but when summer rolls around most of us like nothing better than to invite friends and family around for a barbecue, have a family lunch or dinner out in the garden, or simply lay back on a sun lounger while enjoying a nice cold beverage. To get the most out of these activities, having the right garden furniture is a top priority. So what kind of garden furniture do you need? Well, it all depends on a number of factors that are down to your personal preferences and needs and also to your home environment. If you plan on having a group of friends around for meals, you’re probably going to want to invest in a large dining set. However, if you prefer just to have a couple of drinks with one or two close friends, a small bar area with stools might be a better choice. Is relaxing in peace and quiet your main summer activity? Some nice comfortable recliners, sun loungers or even a hammock might be right for the job. Something for the kids? Maybe a garden rocker or picnic tables and benches where they can play with their toys under the safety of an umbrella. The second thing to think about is size. So many people like the look of something in the garden centre, but after buying it and taking it home, they realise it’s far too big for their intended area and there’s no space to move around it. Either that or the opposite occurs, the furniture looks like a lost little vessel in a giant ocean of open space. You should always measure up your patio or lawn before deciding on your garden furniture, and also bear in mind that you will need space between and around the pieces of furniture too. Next thing to decide is what material would be best for you. Are you looking to save money? Plastic or resin furniture is usually the cheapest available. Want something that will last a long time? Wrought iron could be just the thing for you. More interested in aesthetics? Wicker, rattan and wood furniture can give a warm welcoming look to your garden. When choosing a material, there is also the added factors of where you will be putting your garden furniture and where your house is located. Some materials will last longer when placed on grass than others due to their reaction to moisture from the ground. Do you often experience strong gusts of wind? Lightweight furniture such as plastic or aluminium might get blown across your garden and cause damage. Do you live near the sea? Sea air can cause some metals to corrode faster than if you lived inland so you’ll have to keep up with maintenance in the form of painting or oiling, or opt for another rust resistant material. Furniture is for sitting, lying, and eating on, not just for looking at. Your new modern art style, contemporary design recliner may look like it belongs in a gallery, but if sitting on it for 5 minutes gives you aches and pains, it’s rather a waste of money. Comfort should be right at the top of your list of things to consider when buying garden furniture. Ideally your garden furniture should come with cushions and be ergonomically designed for comfort. If the furniture doesn’t come with cushions, you should definitely think about investing in some. Spending a few quid on some proper weather resistant, outdoor garden furniture cushions is always a good investment as they are mould, water, and fade resistant. Consider storage. When winter comes around you’re going to need somewhere to put that nine seat extra-large garden set that seemed like such a good idea a few months ago. Some garden furniture is easier to store than others, for example, foldable garden furniture is a great space saving idea. You can also leave furniture made from more robust materials, such as metal, outside all winter and just bring the cushions in for storage. Another option is buying garden furniture that wouldn’t look out of place sat in your conservatory or somewhere else in the house and just bringing it in until the sun shines again. Whatever combination of size, material, cost, function, etc. you decide upon, you then have a huge selection of brands and models to sift through to find exactly the right set of garden furniture for you. To ease the burden a little, I’m going to review a varied selection of garden furniture for you, highlighting the good and not so good things about them and comparing them to their closest competitors. So, sit back, relax, and let us shed a little light on the best garden furniture options available in the UK at the moment. 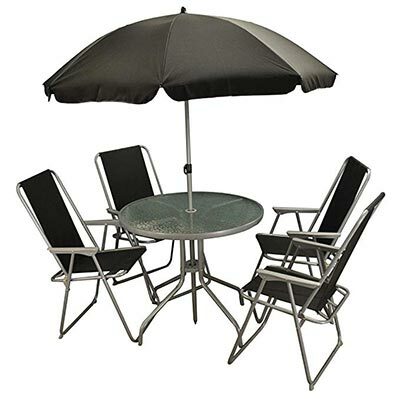 Patio/garden furniture sets- What I class as patio or garden furniture sets are the compact, often lightweight sets comprising of a table (usually with a parasol in the middle) and 4-8 separate chairs. The kind of thing you might sit on around the hotel swimming pool while on holiday. These types of sets are very popular as they are usually considerably cheaper than casual dining sets, are smaller and lighter, and easier to store. Casual Dining/sofa sets- These sofa sets are more expensive than the standard patio sets mentioned above, but they offer a lot more when it comes to achieving a more sophisticated look to your garden furniture and provide a high level of comfort. These sets often resemble ordinary home furniture and look similar to your sofa and armchairs you might have in your living room. Because of this, they can be stored in the home over winter without looking out of place, especially in the conservatory. Bistro sets- Usually a small round table with a couple of chairs or stools. They offer comfort and practicality while remaining compact and space saving. The tables are fine for placing drinks and small snacks but can’t really be used for formal dining. Benches- A bench is a good option for those customers who have limited space available but still ant a nice place to sit and enjoy being in the garden. This type of garden furniture can be found in all types of materials, sizes and styles. Swing seats- Exactly what it sounds like, a seat that swings. There’s something very relaxing about a gentle swinging motion, maybe a throwback to when we were infants?? These days you can buy swing seats that are large enough for multiple people that resemble swinging benches, or you can opt for the more modern small ‘cacoon’ style for individual use. Hammocks- We all have that classic, romanticised image in our heads of laying back in a hammock, hung up between two palm trees, on the beach while watching the sun go down. Well, you might not have your own beach or palm trees in your garden, but there’s nothing wrong with living a little bit of the fantasy out right? Hammocks are cheap, and easily transported and stored. Loungers- If getting a good all round tan while staying comfortable is your thing, you’re going to need a good sun lounger. These range from the low price plastic only type that you throw your beach towel over, to more luxurious designs with custom padding, cushions and places to keep your drinks and snacks. Bean bags- Bean bags are low cost, usually very durable, easy to store away and can be very comfortable. Bean bags could be a good choice if you want somewhere that the kids can use as a seat and also has something to play with. We all remember how much fun it was to throw yourself onto a large bean bag when we were kids. Garden Daybeds- Coming in all shapes and sizes, garden daybeds are great for those of you who have larger gardens. Blurring the line between a sofa and a bed, this is garden furniture for laying back and cuddling your significant other or your children on. Either that, or if you are like me, and love nothing better than space to spread out those arms and legs, sprawling out while enjoying the summer air. Quite a lot of garden furniture options to choose from right there and that’s without taking all the different sub types and materials into account. Ok, let’s kick off our reviews with what I think is the best garden furniture set for those on a tighter budget, then I’ll go up through the price range and look at more expensive sets. Our first review is of a 6 piece metal garden furniture set coming to us from the makers- Selections. Priced at a penny under 85 pounds, it’s one of the cheapest sets you can buy without looking at second hand garden furniture. The set comprises of 4 metal and fabric chairs, a metal and glass circular table, and a foldable parasol. The metal parts on the chairs, table and parasol are all made of steel and powder coated grey. 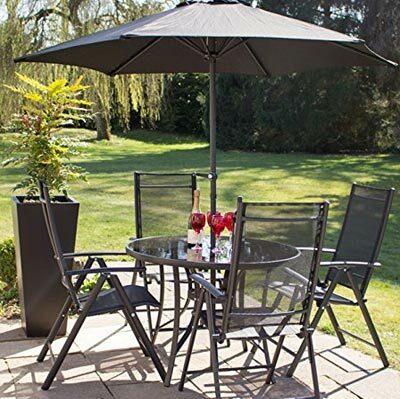 The fabric on the chairs and parts of the parasol umbrella are coloured black, giving this metal garden furniture set a simple yet modern look. The table stands 70cm high and is 80cm across. The table top is made from reinforced glass that is held up from underneath by the top part of the four table legs that all have plastic suckers attached to prevent damaging the glass. In the centre of the table there is a hole for the parasol to fit through and the box contains a well-fitting cover for the hole for when you want to remove the parasol and catch some rays. The back of the chairs measure 90cm in height and the fabric used is textoliene, which is designed to be weather resistant and hard wearing while remaining flexible for comfort. I wish that selections had made the arm rests a bit wider though, as the narrowness of them can be a bit uncomfortable for resting your arms on for long periods. The same can be said about the front bar on the back of your legs but this can be easily solved by a pillow or chair cushions. The chairs are all foldable and can be stored away without needing much space. The parasol is height adjustable so you can lower or raise it to your own preference and the opening mechanism is easy and works well. A simple click of a button and then pushing the parasol up opens up the canopy. The design of the table and parasol allows the table legs to add support to the parasol in order to reduce the amount of movement caused by winds. The whole set was easy enough to assemble, but the screws supplied didn’t look of the highest quality and you might want to pop down to your local DIY store and buy some better ones, just in case. While having its share of flaws, the low price of Sections 6 piece metal garden furniture set, its weatherproof design, and modern look make it one of the best budget options out there. 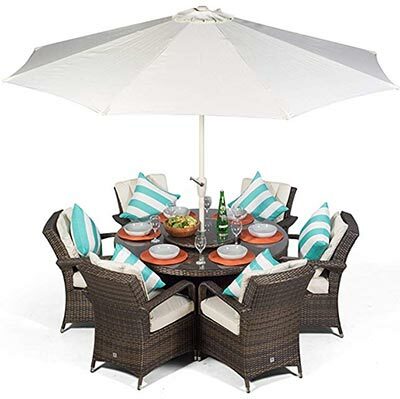 Reduced from its original price of 399.99 to just 189.99, this 8 piece steel garden furniture set is one of the best bargains on Amazon at the moment. Included in the set are 6 chairs, a table and a parasol. The table is a good sized, glass topped rectangular piece of garden furniture made from steel that has been powder coated to make it weather resistant. The dimensons of the table are a 140cm long, 72cm wide and 72cm high, ample space for 6 people. The parasol is 2.5 metres in diameter and can comfortable provide cover for everyone sat around the table. A crank handle is used to open and close the parasol itself and is conveniently placed half way up the pole which fits into the middle of the table. The 6 chairs are good quality and made from textoline. This allows them to be soft yet strong. The chairs can all be folded down completely flat and stored away easily. A good thing about the chairs in this garden furniture set, is that the backs are nice and high, standing at 94cm. However this set shares the same flaws as our previous review. The armrests are too narrow to be comfortable, and you would need to buy cushions to be really comfortable for long periods. The chairs come ready assembled, minus the legs, which you have to screw on yourself. This 6 piece set from Kingfisher is for sale at 219.99 on Amazon UK and has been getting very positive reviews. As above, the set is made up of 4 chairs, a table and a parasol. The main selling point for this metal garden furniture set are the chairs. They are angled in a fairly upright yet slightly declined position that feels natural and relaxed. The backs of the chairs are 90cm high and provide good support and the seat height feels good too. The full seat, padded cushions are of a good quality, easy to wipe down and make this garden furniture very comfortable. The seat part of the cushion slightly hangs over the metal frame of the chair giving you an extra few inches of comfort. I also like the navy blue and white striped colour scheme of the cushions, it is eye catching without being too overstated. The table is a glass top sitting in a powder coated, black metal frame. The rounded edge, square shape goes well with the overall design of this garden furniture set and the hole for the parasol is sized well and is hardly noticeable. The table stands 71cm tall and has a width of 90cm, not the largest, but ample space for a cold drink and sandwich for 4 people. 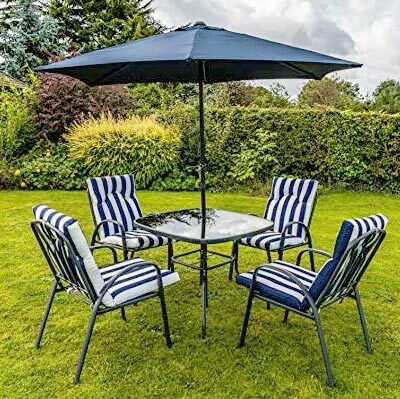 The parasol frame is made from the same powder coated metal as the rest of this garden set and the parasol itself is a beautiful navy blue colour that goes very well with the pattern and colours on the seat cushions. The parasol is opened by turning the winch handle on the metal pole of the parasol itself, and I found this very handy and easy to operate. Everything needed to assemble this metal garden furniture is included in the box, including clear instructions and assembly should take about a couple hours if you’re doing it with someone helping. I did find that a couple of the holes didn’t align exactly right, but they were close enough to get the parts together with a little effort. The only other gripe I have is that the set didn’t include a stand for the parasol so it will move around a bit in the wind. There are stands available to purchase separately, but it would have been nice if it was a part of this metal garden furniture set as a whole. Some of the holes for assembly weren’t aligned correctly and this slowed down assembly. There isn’t a stand for the parasol included in the set and has to be purchased separately. 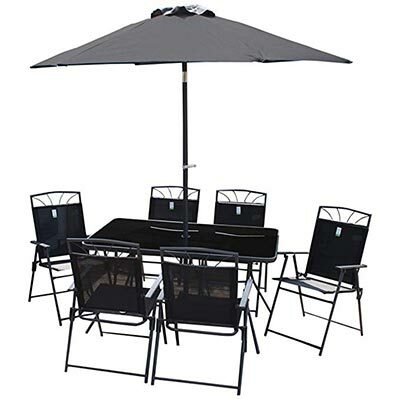 This 6 piece metal garden furniture set from Kingfisher is a very good deal for just over 200 pounds, but I would suggest investing in a stand for the parasol. For 269.99 you can buy this six piece garden furniture set from well-known manufacturers Hectare Kennet and you won’t be disappointed. The first thing that I noticed about this metal garden furniture was that it felt sturdy despite the design being streamlined and modern. The black powder coated steel has been used for all metal parts of this garden furniture so the colour scheme is a complimentary one, and is also weather resistant. The super polytex chairs offer a nice blend of weatherproof durability and comfort. Polytex is polyester fabric with a PVC coating and this makes it waterproof and UV proof and also strong yet still flexible. The chairs are high backed (100cm) and adjustable, and can be reclined surprisingly far back, so it’s easy to find your prefered seating angle. These chairs can be folded up and stored away in the shed, garage or even a cupboard when not needed. A great thing about this particular metal garden furniture set, is that the table is made of strong tempered glass. This is a safety feature, as in the event of the table being knocked over and the glass breaking, it will break up into small pieces that are less likely to cause injury than the shards you get when standard glass is broken. The table is 70 cm tall and the table top’s diameter is 100cm. There are no cross bars between the table legs and this makes it easy for you to spread your legs out and get your feet under the table. The parasol is made from the same powder coated black steel as the chairs and table frame, it weighs 150 grams, is big enough to provide cover for 4 people seated at the table, and is opened and closed by using the crank on the parasol pole. Unfortunately, once again the stand for the parasol isn’t included with the rest of the garden furniture in this set, and needs to be bought separately. Another good thing about this metal garden furniture set is that it is very easy to assemble and you should be able to throw it up in no time and start relaxing in the comfortable chairs. Table design allows you to easily get your feet under it. Hectare Kennet have delivered a good quality metal garden furniture set for under 300 pounds with some nice features, and is only let down by the lack of parasol stand. Although this set is advertised as a rattan garden dining set, and can certainly be used as such, the design resembles what I would classify as a classic patio/garden furniture set so I’ve included it here in this section. It is priced at 599.99. This eye catching, 8 seat rattan garden furniture set is available in 3 different colours- black, brown, and grey, with all three colour schemes coming with pure white seat cushions. The PE rattan material used in this furniture’s construction gives it the classic look of rattan furniture but with the added benefits of being strong, easy to maintain and not fading after long periods in the sun. There are 8 seats in this rattan garden furniture set, 4 high backed chairs that resemble armchairs, and 4 backless stools. All seats are covered in very soft and comfortable, 8cm thick, white cushions. These cushions are waterproof, and can be easily cleaned in a washing machine, which is a good thing because they only come in white and will get dirty quickly. The table is a solid, rust resistant aluminium construction, again covered with the same PE rattan as the chairs, and having a tempered glass top. The glass top is square shaped, measures 120cm x 120cm and stands 75cm high. The legs of the table are arranged in a cross shape and this gives each person sat around the table good leg room. The seats all slide under the table to make a space saving cube for storage purposes. The parasol that comes with this rattan furniture set is a good size (2.7 metres) and is operated by a winch handle on the pole. The pole itself fits through a 4.5cm hole in the centre of the table and can be secured in place so you don’t need to have a separate parasol stand. The Parasol pole feels lightweight yet strong, but the supporting bars under the umbrella don’t seem as strong so care would have to be taken when handling it. Harts premium rattan garden furniture set will be delivered preassembled so you don’t have to worry about putting it together, but please note, that the delivery driver will drop off the whole set on a pallet and will not aid in transportation after it has been dropped off. The set comes with a free weather cover to protect it from the elements. This is an excellent PE rattan garden furniture set. It combines style, comfort and practicality at a reasonable price. If you’re looking for some low cost rattan style garden furniture for your lawn or conservatory and aren’t too bothered about a parasol or a large table for dining on, this is set for you. Priced at only 129.99, the set includes a sofa, 2 armchairs and a coffee table and it’s available in a selection of colours. Let’s start with the sofa. At 106cm wide, it will seat 2 average sized adults comfortably enough, and the 79cm high back provides enough support when lying back. One thing I would suggest though is to purchase some cushions for the backs of the chairs to match the nice, soft, waterproof seat cushions. Like most PE rattan garden furniture, the sofa is comfortable without them but for a few extra quid, it would be worth investing. Also included in this rattan garden furniture set are two chairs. Their dimensions are 79cm high, 59cm wide and have a depth of 61cm, so while they are ok for most people, they aren’t suitable for people with very large frames. A good thing about the compact nature is that the whole set can be arranged so that it fits on even the smallest of patios and decking. Like the sofa, the chairs are comfortable and the seat cushions do their job well, but they would still benefit from having an extra cushion for your back. The table is coffee table size, standing at 39cm high and being just over 70cm wide. It’s big enough to sit a few drinks and things on there, but the height of the table rules it out for dining purposes unless you like eating sat at the edge of your chair and hunching over. The biggest issue I have with this rattan garden furniture set is the table’s black glass top. It is held in place by four suction cups, but they all don’t seem to do their job properly and you need to be careful that the class doesn’t come off if you’re moving it around. 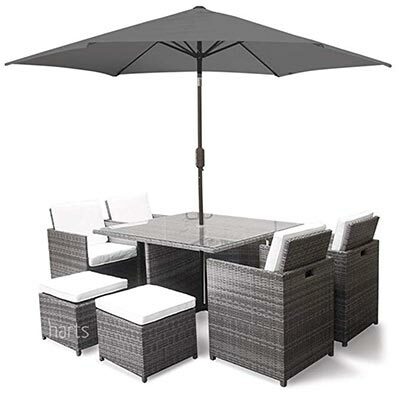 This rattan garden furniture set is delivered flat pack and will require you to assemble it. There is an allen key provided in the box, but if you break out your own tool box and use a bit of common sense, you can speed up the assembly time. The home detail rattan garden furniture set isn’t without a few minor flaws, but for such a cheap price, you’d have to search hard to find a better PE rattan garden sofa set. If you’ve got enough space and you really want to impress people, then a corner garden sofa set is the ticket. Not only do they look amazing, they are great for encouraging conversation and let’s not forget how great it feels to put your feet up and lie down on them when everyone has left. 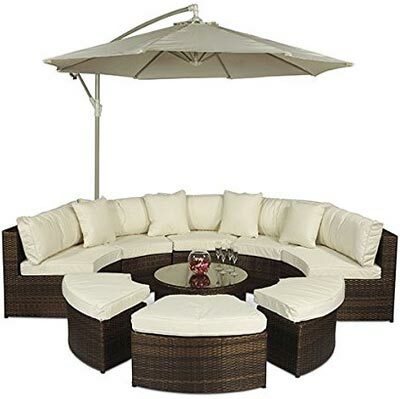 This Yakoe 50020 garden furniture is for sale at 569.99 which places is it at the lower end of the mid-range for this type of set, but the quality rivals other brands and models of rattan garden furniture that are much more expensive. The set is available in black, grey or dark brown. The two largest pieces of this rattan effect garden set are the sofas, each measuring- 144cm long, 80cm wide, and 68m high. The sofas can be placed separately or pushed together to form a corner unit. 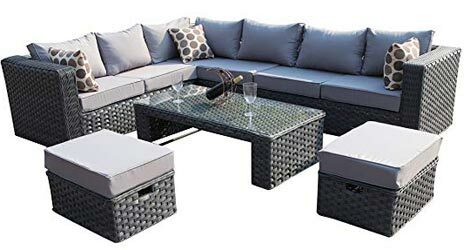 All the pieces of furniture in this rattan garden set have rust resistant aluminium feet but there aren’t any decking clips to hold the sofa pieces together so please bear this in mind. The imitation rattan weave on the sofa and chairs is of a high quality and has a good finish to it, and the cushions are large and very soft, maybe a little too soft as I felt like I sank through them a bit too much. The cushions are wipe clean and waterproof. The two footstools are a good size and also have large cushions on them like the chairs and sofas. The stools can be used as extra seating or simply as a comfortable place to put your feet up if you so desire. The stools are designed to slide under the table when not in use. The rattan effect, glass topped coffee table measures 130cm long, is 65cm wide and stands 38cm tall. The glass sits on a solid PE rattan furniture base and won’t move around or be in danger of sliding off. The table and everything else in this rattan garden furniture set comes pre-assembled so you can unpack and use it straight away. For under six hundred pounds, this rattan effect garden furniture set gives you a lot of seating space, a sturdy table and an eye pleasing look. It’s a shame that the sofas don’t connect together by fasteners though. Alexander Francis’s Rattan garden furniture set is ideal for those you who want the corner sofa look but don’t have a great deal of space on your patio or in your conservatory. It is priced at 695.99 on amazon but with the option to get a voucher that will get you a 100 pound discount. The set is constructed of PE rattan on an aluminium frame. This makes it lightweight and easy to move around yet remains strong and durable. The rattan is weather and UV proof and can be left outdoors without getting damaged by the elements. The best thing about this rattan garden furniture are the 10cm thick cushions. Both the seat and back cushions are very high quality and extremely comfy. The footstool that comes with the set is also covered with the same seat cushions as the sofas. The footstool itself can be used as a table if you wish and the manufactures will send you a free glass top for that purpose. 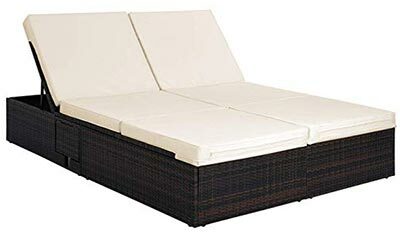 The quality of the PE rattan weave is excellent and I don’t think you will have any problems with pieces coming unwoven or breaking off unless you seriously mistreat this rattan garden furniture. The two tone grey colour scheme looks elegant yet simple and would fit in anywhere. A very comfortable, compact corner sofa set made to a high quality. This is ideal for people without a great deal of space but still wanting the corner sofa look. Are you in the market for some luxury garden furniture? Want something to impress friends and make the neighbours green with envy? 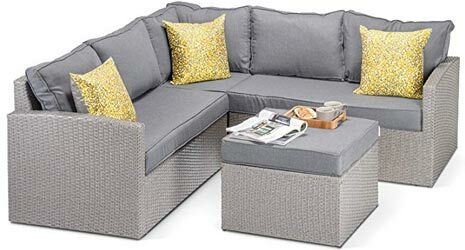 The Monaco large rattan sofa set is indeed luxury garden furniture and it will both impress and cause envy. There are 5 rattan sections that make up the sofa, and they come together to form a large semi-circle. Three ottomans (large footstools to us laymen) can be placed to complete the circle. All together there is enough space to seat 10-12 people, or you can arrange the pieces to make a day bed for yourself to sprawl out on instead. All seats have soft 10cm thick, ivory coloured cushions that look lovely contrasting with the dark rattan furniture. The back cushions are even more luxurious and are 20cm thick. You can really sink into them and it’s so relaxing. The cushions covers are good quality, showerproof and machine washable. The round coffee table is topped with strong and safe 5cm tempered glass and has the same aluminium frame as the rest of the pieces in this luxury garden furniture set. The 3 metre parasol that comes with the set is also made from aluminium and has a crank handle so you can open and close it easily. Please note that the parasol needs counterbalancing with slabs or weights to keep it stable and they are not included in the set. The rattan is made from polyethylene which ensures protection against acid rain, soaps, salt water and both high and low temperatures. The set comes with a free weatherproof, heavy duty cover to keep dust and the elements away. This is a top quality, luxury sofa set that can be used as you please thanks to its modular design. The only drawback is having to get something to act as a counterbalance for the parasol. There’s nothing better than sitting around a table with friends and family and enjoying a delicious meal as the sun goes down. 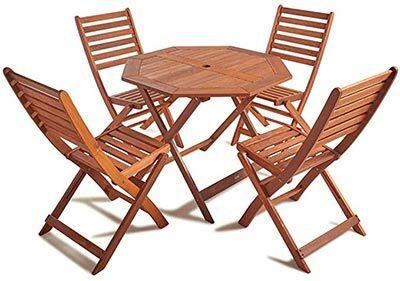 Here I have reviewed a couple of garden dining sets for you take a look at. I’ve decided to sort these by the materials they are constructed by and I’m going to start with wooden garden furniture. If you’re looking to add a bit of good old fashioned rustic charm to your garden, then wooden garden furniture can’t be beat. This 4 seater dining set is made from 100% Malaysian hardwood and is built to last. This garden furniture is for sale for 169.99 on Amazon. The set comes with the chairs already assembled but you need to set up the table yourself. I would suggest getting someone to help you as it will make things so much easier. It can be done on your own but it can be up in no time with a bit of assistance. I was disappointed by the quality of the fixings that came with this wooden garden furniture and opted to use my own which I bought from my local DIY store instead. Once set up, I was really impressed by the overall look. The reddish hue of the Malaysian hardwood contrasted beautifully against a light coloured patio and the table and chairs have subtle but nicely rounded off edges that add to the appeal. The chairs themselves are high backed and stand 91.5cm tall, and the seat part is angled slightly back to give a more natural seating position, but the addition of some seat cushions wouldn’t go amiss. The hexagonal table is sturdy and has a hole in the centre should you wish to purchase a parasol to provide some shade. All pieces of this wooden garden furniture set are foldable, including the table and this makes storing it away in the shed an easy task. For under 200 pounds, this is a great choice of wooden garden furniture that is easy to store away once the weather changes. I would suggest using your own fittings instead of the ones supplied though. This Rowlinson Plumley wooden garden furniture set is for sale at a reasonable price of 272.98 at the moment on Amazon. It is similar in many ways to the VonHaus set we just reviewed, the table and chairs are made of quality hardwood, it has the same reddish brown colour to give it the rustic feel, and the table has the same hexagonal shape, only this time the sides are elongated to provide enough space for more seats. So what is different? Well, for a start this set comes with 6 wooden garden furniture chairs, 2 chairs with armrests, and 4 without. The chairs also come with good quality cushions which is plus over the VonHaus set. The thing that strikes me the most about this Rowlinson Plumley wooden furniture set is the workmanship. It has a very nice finish to it. No sharp edges or big gaps where parts are joined, chairs feel more solid, table feels sturdier, and everything just seems better built than our last review. Again, the furniture comes pre-assembled and all can be folded up and stored away without needing too much space. If you want a bit of shade, you can insert a parasol in the hole in the centre of the table but you would also need a base for it. This set is very similar to the VonHaus wooden garden furniture set above but has better workmanship, is larger and comes with seat cushions. You only have to look around a few garden centres or on the internet to notice that teak garden furniture is among the most expensive, and there are reasons why that is. In addition to looking incredible and elegant (wealthy home owners have ben furnishing their properties with teak for hundreds of years, it also has longevity that other woods can’t match. Teak contains rubber and oils that remain in the wood even after it has been processed and turned into furniture. These oils and rubber protect teak from things that would normally damage wood, such as moisture, fungi, and parasites, so teak garden furniture can be left outside all year round, year in, year out, without sustaining damage. This teak garden furniture set is for sale for 525 pounds, which, considering how long this furniture will last you, is a great deal. 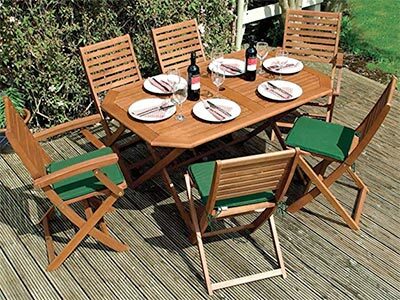 This particular teak garden furniture has been excellently engineered and arrives fully assembled and ready to be used. The quality of everything is top notch, and inspires confidence in the set’s longevity. The table is large, 130cm in diameter and could probably seat more than the four people it was intended for. It is more than enough space for 4 people to dine on. There is a pre-drilled hole for a parasol (not included) that has a teak plug when not using an umbrella. The chairs are 91cm high, 65cm wide, and 56cm deep, so they should be able to comfortably seat most people. There are no chair cushions included with this teak garden furniture set but the chairs are comfortable enough without them. The chairs are stackable to save space when you aren’t using the set. The set is delivered and assembled by the same person. So you don’t have to do anything except sit back and wait a little while. 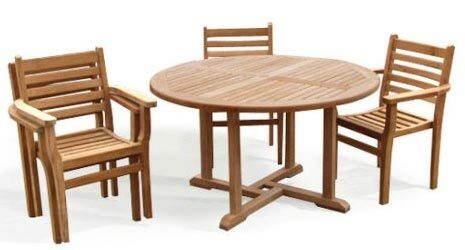 For just over five hundred pounds, this is one of the most affordable, high quality teak garden furniture sets out there. If you’re looking for a stylish rattan garden dining set and you’ve got a thousand pounds to spare, then look no further. The Arizona Rattan Garden Furniture set stands out from its competitors for its looks and overall build quality. The PE rattan used to make this garden furniture is polyethylene rattan and not the PVC material used on cheaper garden furniture. This makes it resistant to a whole range of things such as water, soaps and cleaning chemicals, salt water and more. It is also UV resistant and can hold its structure in temperatures ranging from -15 degrees Celsius up to 60 degrees Celsius. The high quality rattan is supported by aluminium frames, ensuring that having lightweight rattan garden furniture doesn’t come at the expense of strength. The 6 high backed armchairs come fully assembled and all have excellent, 4cm thick cushions for the seat and back. They are incredibly comfortable and the showerproof cushion covers can be easily removed and machine washed for convenience. The round table sits 74cm high and is 135cm in diameter allowing more than enough space for 6 people to dine on it. The glass top is made from 5cm thick tempered glass which makes it strong and also much safer than ordinary glass should there be an accidental breakage. Although the chairs come fully assembled, you will need to attach the legs onto the table yourself, but it is an easy task. The Arizona rattan garden furniture set comes with a free parasol that is very large and provides enough shade for all 6 diners and is operated by a crank on the pole. Also included is a 10kg base for the parasol which will keep it from moving around in windy weather. The only flaw I could find is that the instructions for putting the table together aren’t the best but to be honest, they aren’t really needed. 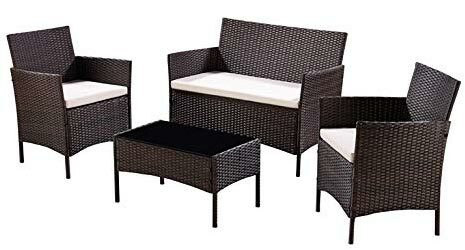 This is a rattan garden furniture set of the highest quality. It looks incredible, provides amazing comfort and is built to last. If you have the money spare, I would highly recommend this set. If you are lucky enough to live in a property that was built in a different period, such as a lovely traditional garden cottage or large country home, you are probably looking for garden furniture that keeps with the old-time, rustic appeal of the property itself and not some modern, contemporary garden furniture. As the name suggests, this metal garden furniture dining set from Kingfisher is designed with a vintage look in mind. 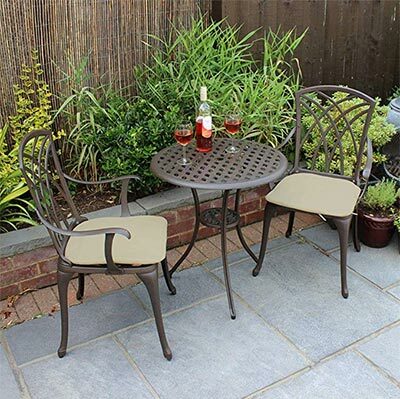 A bench, 2 chairs and good sized table make up this wrought iron garden furniture set and are all coloured vintage grey, a neutral colour that will go well with any property. The chairs are armless and have wooden seats, and the backs of the chairs are 99cm high, god enough for even the tallest of people. The wooden seat sits 40cm from the ground and is 40cm wide and deep. The bench follows the same design as the chairs, wrought iron furniture frame with a wooden seat. All three have a beautiful ornate design to the backs and tops of them in shaped wrought iron. The Table is also topped with a classic wooden piece which looks beautiful but you might want to think about putting a cover on it to increase longevity. The wrought iron table sides and legs are decorated with twisted ornate patterns like the chairs and bench. The table stands 77cm tall, is 120cm long and 75cm wide. This wrought iron garden furniture set comes fully assembled and just needs you to unfold it to set it up. Of course this means you can fold it back up when you want to put it away too. The kingfisher vintage, wrought iron, garden furniture set is for sale at a price of 279.99. A lovely vintage style, wrought iron garden furniture set that is solid, sturdy and looks beautiful. Just make sure you take care of the wooden seats and table top. Prefer dining more privately rather in a larger group? Well, a bistro set might just the thing for you, and this particular metal garden furniture set is one of the best deals available in the UK right now. The set is constructed of weatherproof, cast aluminium, coloured with a beautiful bronze finish. The overall design is simple yet still ornate and would look good in anyone’s garden. The backs of the chairs are decorated with a curved, crisscross pattern that spans from the top of the 89cm high back to the seat. The armrests are also curved and allow your arms to sit naturally and comfortably on them. The 3cm thick seat cushions are made from olefin, a durable fibre that is resistant to staining, mildew, abrasion and sunlight, while remaining soft and comfortable. The table top is 22” in diameter and also has a nice crisscross design, albeit this time in straight lines rather than the curved pattern of the backs of the chairs. Despite its lightweight, it doesn’t feel flimsy at all, and all pieces of this metal garden furniture set have been fitted with rubber feet to stop scratching and avoid annoying noise when moving the furniture around. It has to be said though, that this garden furniture is made from aluminium which makes it very light and you will have to be wary of strong winds blowing it over, it should be fine in any normal strength winds. Assembly is straight forward enough thanks to good quality engineering insuring that everything lines up properly. The instructions could have been better but it wasn’t hard to work out what goes where anyway. 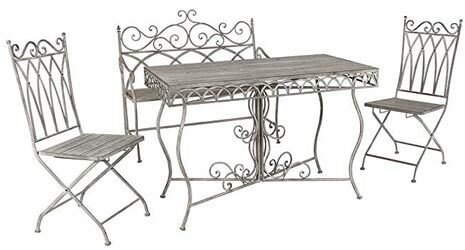 This is a beautiful and well-made metal garden furniture set that deserves all the good reviews it is receiving online. For sale at 169.99, it is in most people’s price range too. Priced at 39.99, this garden recliner is a good value for money piece of garden furniture. Sporting a modern stylish look and having some nice little features, this is the best recliner option under 50 pounds. The frame is powder coated steel and the fabric used is hard wearing, close weave textoline, which has become a popular choice for outdoor furniture, due to being strong and weatherproof. . It can bear loads above the 110kg maximum that the manufacturers suggest. Changing the position of the chair couldn’t be easier as there are no switches to click or press. If reclining, all you have to do is push your head back and apply a bit if pressure and at the same time raise your legs slightly to allow the chair to change shape. If you want to sit upright again, reverse the process. You can lock it in place by operating a lever under the armrest. 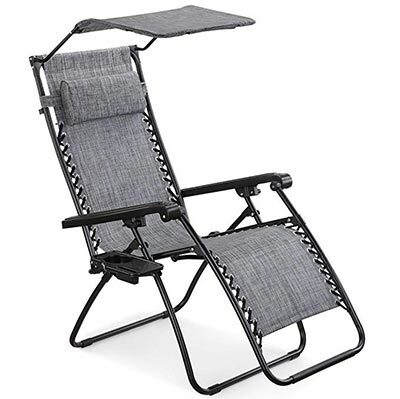 The Zero Gravity chair has a handy drinks holder on the side, which can also be used to put a bowl of snacks on or a convenient place to keep your mobile phone. There is also an adjustable shade canopy just in case the sun gets a little too much for the eyes. I had problems making the canopy stay in place without tightening the screw in the model I tested though. There is a head pillow that can be detached and removed if you so wish. This piece of outdoor garden furniture folds away very easily and once folded, it is very compact and can be stored or transported in the back of a car should you want to take it with you to the beach. The garden recliner weighs 10kg, which is just enough to keep it stable in winds without making it heavy. If you suffer from any long term injuries or disabilities though, you should get help moving it around just in case. The Zero Gravity is a nice budget recliner that has a few extra features such as canopy and drinks holder, but obviously, when dealing with cheap options, longevity is always a question. 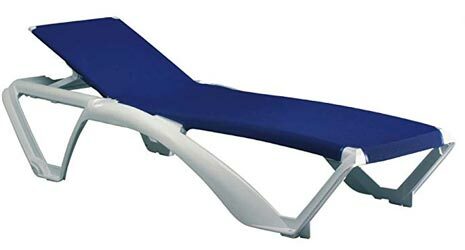 For 238.99, you get two of these Resol Marina sun loungers, so you and your significant other don’t have to fight over who gets the best chair. This product is available to buy as a single piece too if you don’t mind the dirty looks you’re getting laid out next to him/her while they sit in the 10 year old deck chair you found in the shed. While each chair is 3 times the price of the Zero Gravity recliner we just reviewed above, the quality and longevity of this outdoor garden furniture makes it worth it. These sun loungers are the same ones you will see on Thompson cruises and scattered around hotel swimming pools all over the world, and there’s a reason for that- they are heavy duty garden furniture and built to used and used again and again. This sun lounger’s frames are made of solid polypropylene resin that makes them very strong but this also means that they are not foldable. Fortunately they are stackable and can be left outside all summer and winter and will look as good as new after a quick blast with a pressure washer. Like the strong frame, the poly coated fiberglass fabric can bear heavy loads. This fabric also means that you don’t have to choose comfort over durability, as these sun loungers are very comfortable and don’t require any additional cushions. The Resol Marina sun lounger can be adjusted into 4 different reclining positions and the tipping mechanism is easy to use, and like the rest of this outdoor garden furniture, high quality, heavy duty and long lasting. This plastic garden furniture is available in a variety of colours and all measuring (when lying flat) – 190cm long – 73cm wide – 35cm tall at the lowest point. If you want something that looks stylish and is built to last, this sun lounger is for you. The initial cost is higher than some of the budget options but the longevity and quality makes it more than worth it. 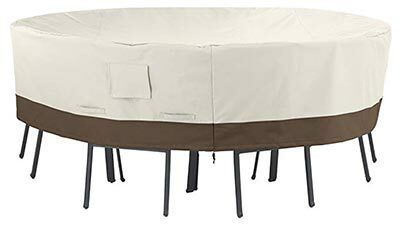 Dueba have given us this great little 2-in-1 product of twin sun loungers that can also double as an outdoor daybed. It is on sale for 219.99 on Amazon. Ok, first of all let me get the main drawback out of the way. This piece garden furniture does require assembly and it will take you a while, so grab your toolbox and someone to help you. Some of the holes might not align just so, but persevere and you’ll be rewarded. Once constructed, this is a great product. The base is weatherproof and UV proof polyrattan, which is longer lasting than traditional rattan, lighter and cheaper. The polyrattan covers the robust metal frame that gives this garden furniture its feeling of solidity. There is a drinks holder that can be pulled out from the side of the base when needed and pushed back in flush with it when no longer in use. The cushions are 7cm thick, super comfortable and water resistant. The pads can be fixed onto the frame to stop them sliding around and the pillow can removed by undoing the Velcro straps. The backrests are adjustable and you can choose from 5 different reclining levels. Both ends can be elevated at the same time if you prefer to have your feet raised a little while you lay back with a good book and/or cold drink. As mentioned, this is a double sun lounger set and is large enough for two people to share with enough space to be more than comfortable, or you can fold it all down and use it has a day bed. The headrests when reclined, and also the mini drinks table when pulled out, are supported by sturdy metal poles that inspire confidence in the overall build quality of this outdoor garden furniture. If you don’t mind spending half a day constructing this garden furniture with a friend, then I’m sure you will be more than happy with the finished product. The most reliable way to keep your garden furniture in good condition is to cover it over with a purpose made garden furniture cover. Make sure you get the right shape and size to match your garden furniture or you might find yourself frustrated while trying to pull the thing into place. Here I have reviewed a few for you. As you’ve probably guessed from the name, this is a large cover designed for protecting a round patio table and chairs. It costs 36.99. The cover is made from 100% woven polyester fabric with laminated polyvinyl chloride backing. This material is designed to protect your garden furniture from all kinds of outdoor elements, such as rain, snow and other naturally occurring damage. There is also ventilation to prevent damage from condensation. It is large, measuring 243.8 x 243.8 x 61 cm and will cover a round table and six chairs and still have space left. It can also be used to cover a garden daybed or any other round garden furniture. Weighing 3.95 Kg it is neither too light nor heavy and there are click-close straps for securing the cover to your garden furniture so you can rest easy in strong winds knowing that you won’t see this product blowing away down the street. The only thing I don’t like about this is the colour. I just think it will look dirty after a while no matter how well you keep on top of cleaning it. 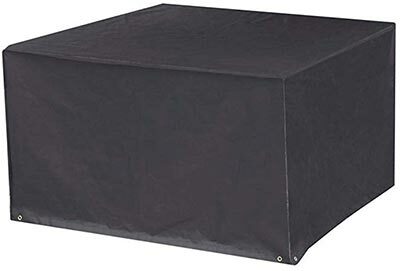 Measuring 120 x 120 x 74 cm, the heavy duty cube garden furniture cover should be able to envelop most mid-sized square, cube and rectangle garden furniture sets. It can also be used for benches and sun loungers too. This heavy duty cover is made from a thick material called 600D high density nylon oxford fabric. It is strong, breathable and has high elastic and waterproof qualities that prevent dirt accumulating. It also has a UV resistant inner layer and will protect your garden furniture well from all kinds of weather and won’t tear easily. There are eight eyelets on the bottom of the cover for securing the cover down in the event of windy weather. Ties or straps are not included though. This cover comes with its own zippered storage bag to keep it in when you’re not using it and it folds very easily into a compact shape. On sale for only 14.99 it is a very good deal. For under 15 pounds, you would have to search hard to find a better cover for your small to mid-sized garden furniture. 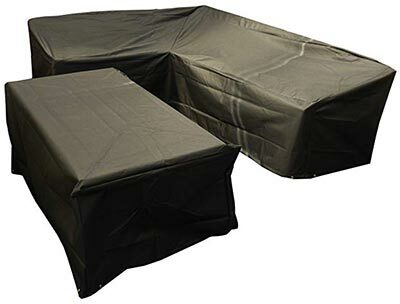 This set of heavy duty garden furniture covers is specially designed to be used with large, modular garden furniture such as corner sofa sets and casual dining sets. It is priced at 59.49 with free delivery in the UK. This set includes covers to completely envelop and protect your L-shaped sofa and also your dinig table or footstools. The L-shaped sofa cover measures 286cm along the top of the longer right side, the length along top of the Shorter Left Side is 222cm it is 78cm high and has a width of 82cm. The table cover has a length of 155cm, a width of 95cm and height of 68cm. Both heavy duty covers are made from top quality UV Stabilised PVC Backed Polyester. This material is tough, waterproof, even when puddles form on top of it for extended periods, and it provides protection from the sun. The covers have eyelets so you can tie down the cover to keep it in place over your garden furniture when the inevitable strong winds come along. Bosmere have supplied plenty of ties in the box for you to use in this process. These ties can be a bit fiddly though, it has to be said, and I would suggest securing it with a long piece of bungee cord from the DIY shop instead. Overall everything about this set is high quality. The materials used, the stitching, everything all feels well made and worthy of the price tag. This double cover set might be more expensive than the others but they are very high quality and you are getting two separate covers that are specially made for modular garden furniture. I’m going to finish this article with my picks for best swing chair. The swing chair I chose is.. I chose the Yaheetech black rattan hanging swing chair for two main reasons- the way it looks and its practicality. Firstly, its looks. 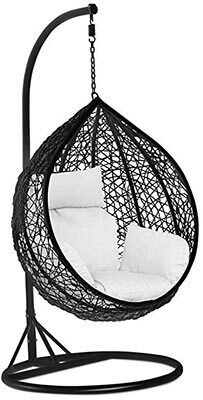 The black rattan weave frame is shaped like a giant teardrop /egg and the contrast between this and the bright white cushions really catches the eye. This set is also available in white with grey cushions, but I prefer the black. Secondly, this hanging swing comes with its own special stand, so you don’t have to drill holes in anything or find a strong beam to secure it. This also means that you can move it around wherever you want to. The stand itself has a nice curved aesthetic that adds to the overall look of the chair rather than taking away from its beauty. The stand is made of black iron, as is the frame, and the rattan is synthetic polyethylene. This combination makes this chair strong and stable enough to handle 150kg swinging in it. The chair size is 109 x 69 x 91cm, and the overall size of the product is 94.5 x 94.5 x 194.5cm. The white cushions are made from polyester and are large, soft and comfortable. I particularly like the padded headrest part and the fact that the cushions come up the sides to form a sort of armrest. These cushions coupled with the arched back of the swing chair provides a lovely seating position. This swing chair needs to be assembled but it is very easy to put together and you can be curled up inside it and swinging away in no time at all. The only thing I can say I didn’t like is that there was a slight squeak form the chair from time to time but it wasn’t anything terrible. This garden swing chair can also be used in the home or conservatory and is priced at 201.99 with free shipping on amazon. This swing chair combines beautiful aesthetics with good old practicality. The fact that it comes with its own stand allows you freedom of movement when choosing where to sit, and the large cushions and rounded egg shape of the chair provide a lot of comfort. Well, that concludes this article on garden furniture. I really hope that you found these reviews helpful and informative, and now have a better overall idea of what your options are when it comes to purchasing garden furniture. Just remember the tips I gave you at the beginning of this article about choosing furniture that suits your purposes, measuring up your available space before considering any furniture, and having a good think about what material and style would suit you best.